It is through photosynthesis that earth's biosphere derives its energy from sunlight. Photosynthetic organisms, i.e., plants, algae and photosynthetic bacteria, have developed efficient systems to harvest the light of the sun and to use the light energy to drive their metabolic reactions, such as the reduction of carbon dioxide to sugar. The ubiquitous green color of plants is testimony to the key molecular participant in the light harvesting of plants, chlorophylls. More hidden in this respect, but no less widespread, is a second participating molecule, carotenoid. In green leaves the color of the carotenoids is masked by the much more abundant chlorophylls while in red ripe tomatoes or petals of yellow flowers, the carotenoids predominate. Chlorophyll molecules exist in slightly different chemical structures in various photosynthetic organisms, as chlorophyll a or b in plants or algae, and as bacteriochlorophyll a (BChl-a) or b in photosynthetic bacteria. Molecules such as chlorophyll and carotenoid that absorb light and impart color to living matter and other materials are called pigments. 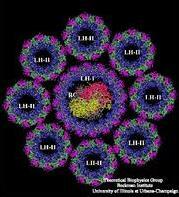 In general, biological pigments are non-covalently bound to proteins, forming the so-called pigment-protein complexes. The pigment-protein complexes are organized as the photosynthetic unit (PSU). The bacterial PSU consists of two types of pigment-protein complexes: the photosynthetic reaction centers (RCs) and the light-harvesting complexes. 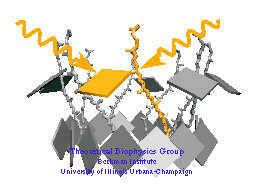 The main function of the light-harvesting complexes is to gather light energy and to transfer this energy to the reaction centers for the photo-induced redox processes. 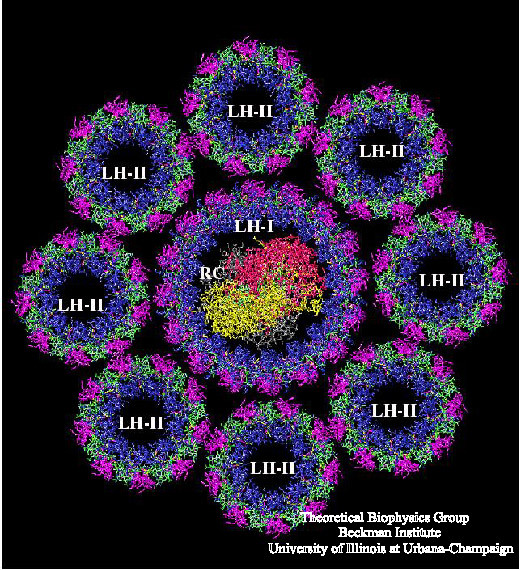 In most purple bacteria, the photosynthetic membranes contain two types of light-harvesting complexes: light harvesting complex I (LH-I) and light harvesting complex II (LH-II). While LH-I is tightly bound to the photosynthetic reaction centers, LH-II is not directly associated with the reaction centers, but transfers energy to the reaction centers via LH-I. Purple bacteria are great masters of harvesting light. Nearly all the energy gained by the absorption of a photon is transferred on to the reaction center. To illustrate how purple bacteria achieve such high efficiency, we trace the way of a photon (and its excitation energy, respectively) through the light-harvesting system. On this way we will point out the remarkable geometrical features that serve the process of harvesting light. It is the goal of our research to understand how these geometrical features translate into physical properties that ideally support the biological function. It will be shown that purple bacteria exploit elegant quantum physics, the working of which were only fully understood recently after the discovery of the structures of light-harvesting complexes and investigations into their electronic excitations. Light is absorbed either by bacteriochlorophylls or carotenoids in different spectral regions. Two kinds of bacteriochlorophylls absorb at slightly different energies and at different angles. The ring structure enhances absorption and generates an energy trap. In addition to photoprotecting chlorophylls, carotenoids also enhance the absorption crossection by absorbing light in the green light range. They transfer their electronic excitation within about 100 fs to the B850 BChl ring. B800 BChls transfer excitation via the Foerster mechanism to the B850 BChl ring. The transfer occurs within less than one picosecond. The ring structure accelerates this transfer by enhancing the spectral overlap through exciton splitting. 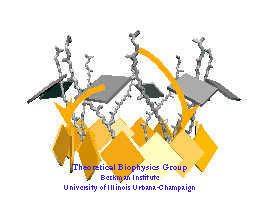 The coplanar arrangement of BChls is ideal for excitation transfer between the BChl rings which proceeds within few picoseconds. Transfer from the LH-I ring to the RC is accelerated by bridge BChls. Contact Us // Material on this page is copyrighted; contact Webmaster for more information. // Document last modified on 27 Jan 2006 // .